The important things is – if your society organized itself along one of these structures – it is challenging, if not impossible to see a solution outside of that structure. What I think is exciting is that the egalitarian mode of thinking – thanks to the internet and social software – may be ascendant, explaining some of the reason market based systems (individualists) and bureaucracy based systems (hierarchist) feel threatened. Fatalists feel isolated in a world that imposes arbitrary constraints on them. They view nature as a ball on a flat surface, rolling randomly in any direction. There is little they can do to control their situation, and resign themselves to riding out whatever fate throws at them. Hierarchist see a society with a well-defined role for each member. Thus , they believe in the need for a well-defined system of rules, and fear social deviance (such as crime) that disrupts those rules. Hierarchists see nature as “perverse/tolerant”: it can be exploited within certain limits, but if those limits are exceeded the system will collapse. They thus rely heavily on experts, who can identify those limits and establish rules to keep society within proper bounds. Individualist see their choices as unconstrained by society and they lack close ties to other people. They value individual initiative in the marketplace, and fear threats like war that would hamper free exchange. The individualist view of nature as resilient. Like a ball resting at the bottom of a cup, nature will return to its original stable position after any disturbance. Thus, individualists embrace trial-and-error, as they have confidence that the system will fix itself in the end. Arguably, much of the left-right axis of our politics is a battle between Individualists on the right (let the market rule!) and Hierarchists on the left (government oversight!) with fatalists abstaining (what’s the point?). Hood’s description of Egalitarians is intriguing mostly because I think it is quite narrow and, if slightly tweaked, could help describe the rise of an important new block of voters (part of the neo-progressive movement Taylor and I write about). 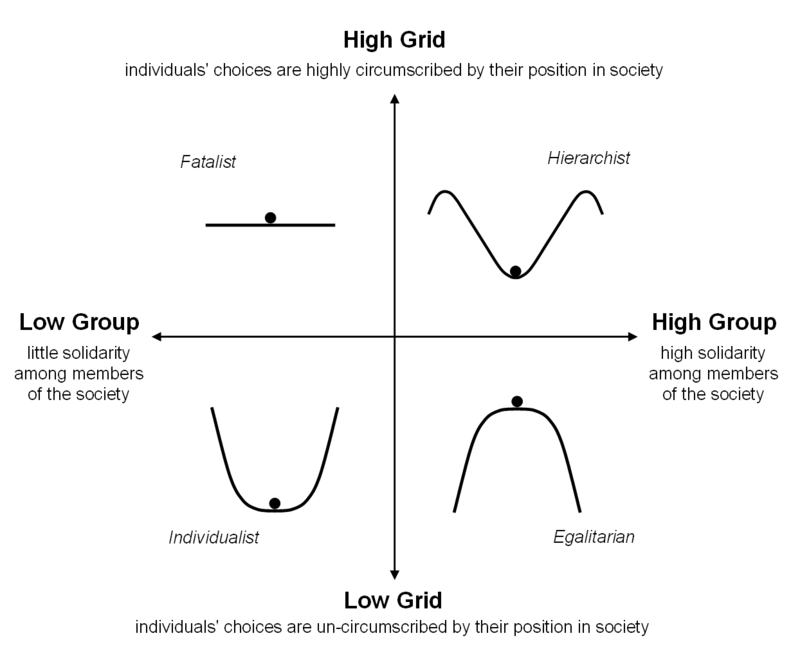 Egalitarians experience low grid and high group. They live in voluntary associations where everyone is equal and the good of the group comes before the good of any individual. In order to maintain their solidarity, egalitarians are sensitive to low probability-high consequence risks (such as nuclear power), and use them to paint a picture of impending apocalypse. Risk and Culture was, in part, a polemic against the environmental movement, which Douglas and Wildavsky saw as sharing the worldview and social organization of religious cults. Egalitarians see nature as fragile, like a ball balanced precariously on an overturned cup. Any small disturbance will send it crashing down. Thus egalitarians advocate the precautionary principle and cling to traditional ways of life that have proven to be sustainable, rather than risking disaster by trying new technologies. Hood describes the Egalitarian way as one with high levels of cooperation within a group that is socially distinct from the outside world and which relies on dynamic rules set through constant debate and case-specific solutions to every issue as it arises. Hood’s contempt is well placed. Many tightly held communities facing what they believe to be massive threats can indeed take on cult-like characteristics. But that is not their only possibility. Indeed, societies that organize along these lines have new powerful tools – namely the internet – to use to organize themselves. More importantly, these communities can coordinate themselves and achieve powerful outcomes even with weak bonds. Many of the “egalitarians” I see today are those creating projects that seek to engage citizens and pool individual resources to address collective problems. Indeed, many open-source projects fit this mold very well. More importantly, most of these projects are not cult-like, but are self-organizing and emergent. They see that a situation (like the environment or the open web) is vulnerable and they don’t believe a) it is self-correcting (like individualists) b) it can be perfectly moderated or controlled by top down systems (like hierarchists); or c) that collective or individual action is futile (like fatalists). There are few examples of egalitarians (or emergents) that spring to mind as successful – certainly the organizational and political discourse has been dominated by hierarchists and individualists. Maybe this explains why people have such a hard time defining new forms of organisation – like open-source projects. They are trying to peg their participants as either right-wing market loving individualists or left-wing regulation loving hierarchists. The fact is they are neither. While hardly uniform, my experience is that they are often libertarians (low-grid) who believe in free-association, collaboration and emergent systems (high-group). The increased manifestation of this new structure in society could diversify how we perceive and try to solve problems. But in the short term observers (like pundits on CNN) will continue to try to put force this peg of a new circular group into an old square hole. This entry was posted in free culture, open source, technology and tagged collaboration, cooperation, free culture, mozilla, open source, technology on November 24, 2008 by David Eaves. Robert – good points. I think you are right about narrowly defined – it isn't. I think I meant to say, narrowly construed. The application of the definition offered is one that is largely negative and problematic. (This is in response to brett)Re: #2, Fairness: I just read Margaret Atwood's Massey Lecture, called Payback, about Debt and Society, in which she uses an interesting example of primate behaviour to illustrate an idea that sharing and fair treatment are innate values in primates, ourselves included. Each individual in a group of either chimps or monkeys was given cucumber slices in return for something (a shiny coin, I think). Every animal got one cucumber slice, and no problems. In the next round, researchers gave one animal a grape instead of a cucumber slice (the grape being more desirable), and the rest of the group got pissed off, feeling they were treated unfairly. All of a sudden cucumber slices weren't good enough for the rest of the animals. Wow that's a really interesting topic one can talk about much. Such cultural theories of risk and the rise of emergence systems is a topic that all of us should interest.